I am still loving the Simon Says Stamp April 2017 Card Kit. 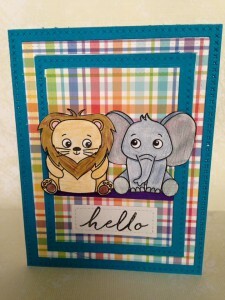 Here is another card I made using the kit and the Cuddly Critter Accessories Set. The lion’s eyes amuse me and I couldn’t help myself. I had to make him look at the mouse. Extra Details: I started with a panel of white card stock. 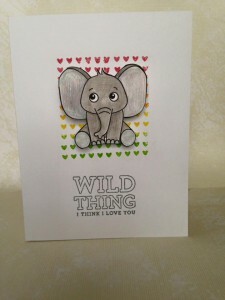 I stamped the outline heart strip in black in over the whole background. I left some black areas for interest. Using the ink cubes included in the kit, I filled in some of the hearts with the solid heart strip. I offset the stamping for added interest. Using a stitched rectangle die, I cut the stamped panel down to 4.25 x 5.5.” I used a Polaroid frame die to cut out the center of the panel. Using the same die, I cut a black fun foam frame and a black card stock frame. 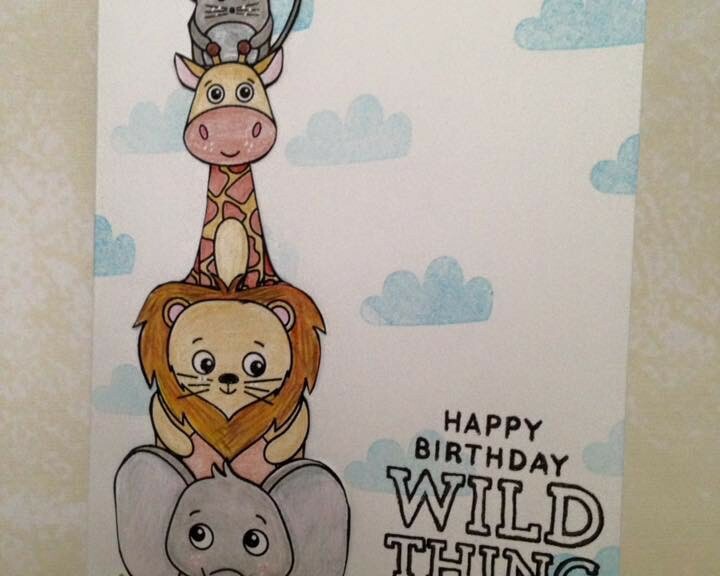 I stamped the critter animals on a scrap of white cardstock and used colored pencils to color them in. Once, finished I fussy cut them out and painted the edges with a black marker. I stamped the sentiment and some more hearts on the black card stock frame and embossed them in white. I adhered the black card stock frame to the fun foam one. I created a card base form some white card stock. I adhered the heart panel to the front of the card base. I pieced the black frames into the hole. 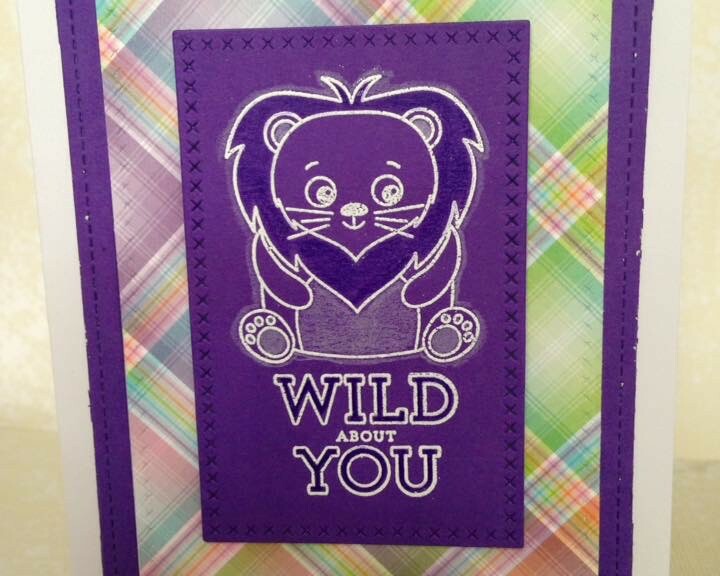 I added a scrap of pattern paper cut with a grassy border die to the card base. I used a blue colored pencil to add the sky in the frame. 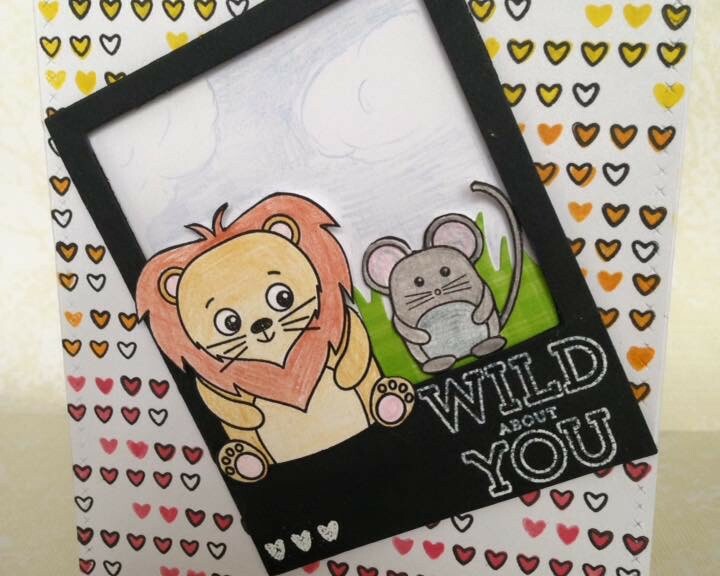 Lastly, I adhered the mouse inside the frame and the lion outside of the frame. Sometimes I’m just in the mood to make a quick card. I am still smitten with the Simon Says Stamp April 2017 Card Kit, so I drew most of my supplies from there. This card took me about 20 minutes and is one of my current favorites. Extra Details: I started by making a white card base. Then, I masked out a rectangle on my card base using a left over frame from another project. I stamped the strip of solid hearts in the four ink colors included in the kit. I did some fancy inking to help the colors transition. 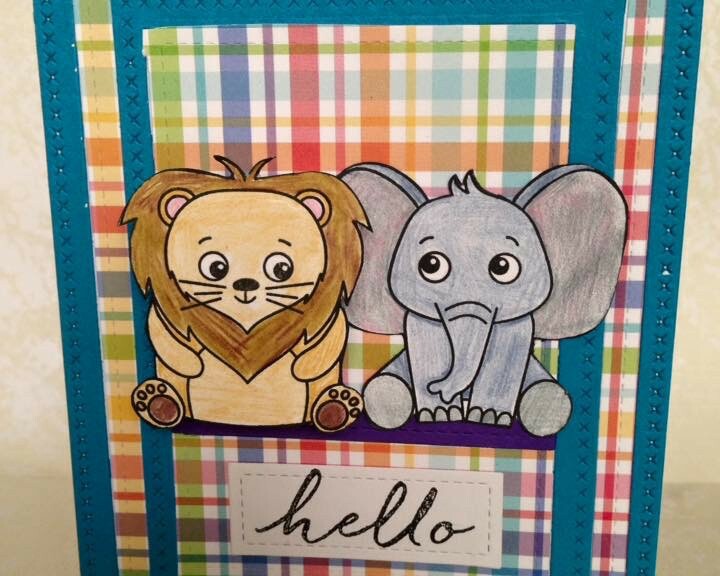 The elephant was already colored and fussy cut. So all I had to do was attach an action wobble on adhere him in the middle of the hearts. Lastly, I stamped by sentiment. I used a dark grey ink because it was what I could find fast. Just before my Simon Says Stamp April 2017 Card Kit arrived, Jennifer McGuire posted a video called Monochromatic Coloring. I wanted to give the technique a try and the dark card stocks in this kit were perfect. I made two cards using this technique. Extra Details: I started by white heat embossing the images and sentiments on panels of the dark colored card stock. I used a white color pencil to add some highlights to the images. For the darker areas, I used a colored pencil that was slightly darker than the color of the cardstock. I die cut a series of stitched rectangles of the colored card stock and patterned papers form the kit. For card one, I adhered the outer frame and the patterned paper to the white card base. I used fun foam to pop up the stamped rectangle. For card tow, I pieced the blue and patterned paper rectangles back together on white card base to create an inlayed pattern. I am really enjoying the Simon Says Stamp April 2017 Card Kit. I love the stamp set and the papers, but the Action Wobbles may be my favorite part. Here is a card I made with an action wobble. Extra Details: I started by stamping and coloring my images on some white cardstock. I used colored pencils to color in the images. Once done, I fussy cut the images out and painted the edges with a black marker. I die cut a series of stitched rectangles of the blue card stock and patterned papers form the kit. I pieced the rectangles back together on white card base to create an inlayed pattern. I also die cut a scrap of the purple card stock for my animals to sit on. 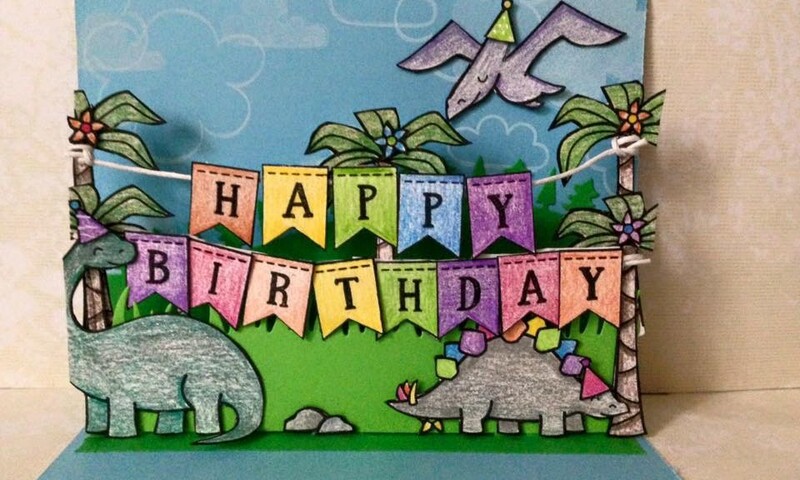 I adhered the purple strip and the elephant flat to the card. I used a mini action wobble to adhere the lion. He is some much fun to play with. I stamped the sentiment on a scrap of white card stock, die cut it with a stitched rectangle, and adhered it to the card. It was a fun weekend of making cards using the Simon Says Stamp April 2017 Card Kit. Here are two more cards that I made using the kit. Extra Details: I started with two panels of white card stock. 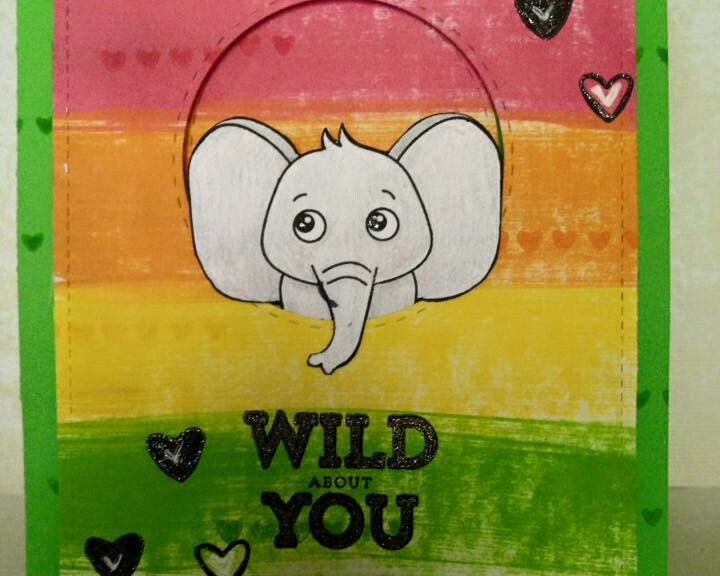 I used the colored inks that came in the kit to stamp the images. 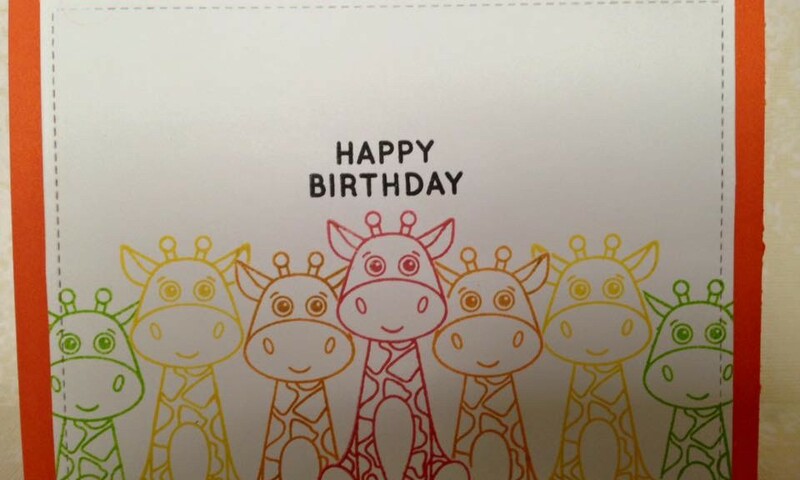 For card one, I made a mask for the giraffe so I could layer them together. On card two, I made a stamping mistake. GRRRR… but rather than start again, I re-stamped the elephants and birds on a scrap of white card stock, fussy cut them out, and popped them up using dimensional glue dots. I stamped my sentiments using black ink. I used stitched rectangle dies to cut each panel before adhering them to orange card bases. The orange card stock was from my stash. I just subscribed to the Simon Says Stamp Monthly Card Kit. I am very excited to have a box of crafty stuff show up at my house every month. My first kit is the April 2017 kit. 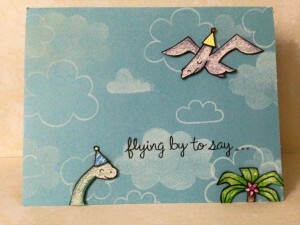 This card was inspired by Heather Ruwe’s card on the inspiration sheet. I love the way it turned out and will be using this layout again. Extra Details: I started with a panel of white card stock. I used the four mini ink cubes to add strips of color to the panel. It was a straight to paper application. I used the same ink to stamp the strip of solid hearts in each stripe. I added some hearts and the sentiment in black ink. I added some black glitter gel pen and white gel pen to the hearts and sentiment. 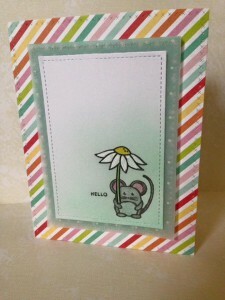 I created a card base from some green cardstock I had in my stash. I added some more solid heart strips with the green ink. 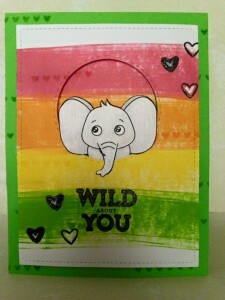 I stamped the elephant on white cardstock and used colored pencils to color it in. 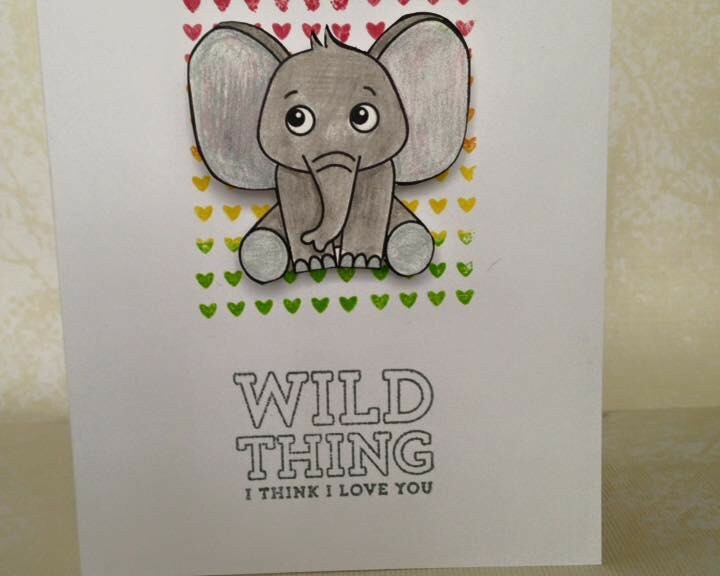 I fussy cut the elephant out and painted the edges with a black marker. I did cut around the trunk of the elephant so it could hang out over the circle. I die cut the white card stock with a stitched rectangle and a stitched circle die. I adhered the circle die cut to the card base. I adhered the elephant on the panel and used fun foam to pop the whole panel up. I just got my Simon Says Stamp April 2017 Card Kit in the mail this weekend. 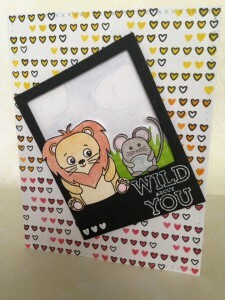 I love the Wild Cuddly Critters Stamp Set. 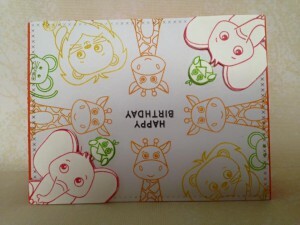 I also own the Cuddly Critters Accessories Stamp Set. As soon as I looked at the two sets together, I know that I would be combining the stamp sets. Here is a card I made using both sets. Extra Details: I started by stamping all of the critters on white card stock. I choose not to use the penguin; he seemed out of place. I used colored pencils to color everything in. Once I was done coloring, I fussy cut all of the images out. I used a black marker to paint the edges to hide any cutting mistakes. To make the bird sit on the mouse’s head, I trimmed around his wings. Next, I created my card base. I made a 4.25 x 7 inch card base so that I could fit all of the animals stacked up. I added some clouds to the card base for interest. I also added a strip of green plaid paper cut with a grassy border die. I stamped the sentiment next. 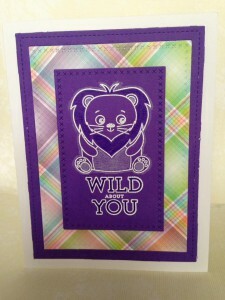 I used part of a sentiment from the Wild Cuddly Critters set and a sentiment form the Cuddly Critter Accessories set. 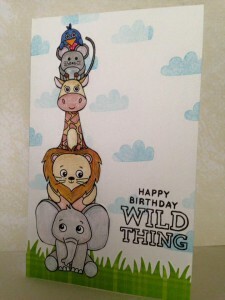 Lastly, I adhered all of my animals in a stack and the card was finished. A friend brought each of my children a t-shirt form their recent trip to Japan. 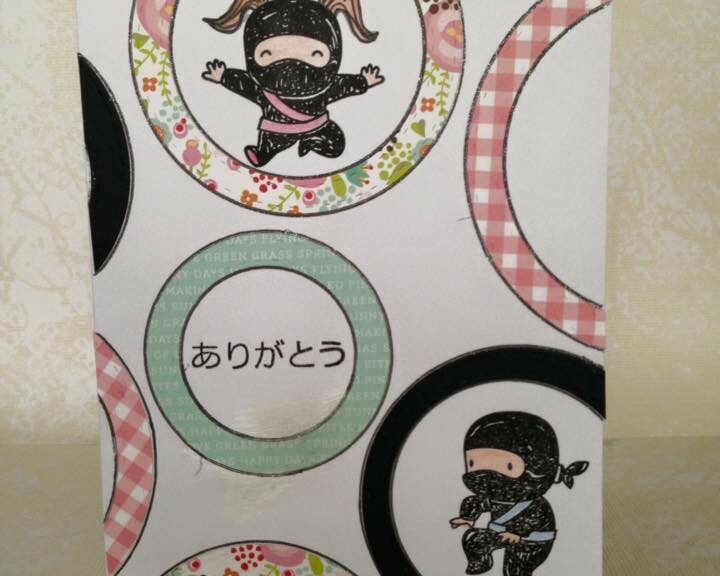 One of the shirts had a ninja on it, so we had to make a ninja thank you card. 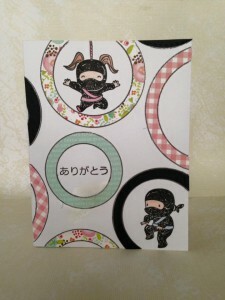 Extra Details: I started by stamping my images on the white card base. I used a black pen to draw in the pigtails and rope. I used colored pencils to color in the images. Then, I added some stitched circles cut from patterned paper. 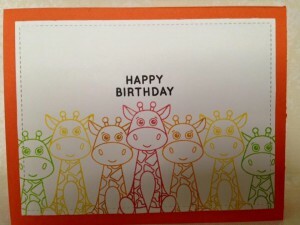 I focused on the images and sentiment first and then filled in the others, until I liked the way the card looked. I used a black glitter gel pen to outline all of the circles. I was just having fun making a card that meets the requirements of two current challenges. This card will be entered in Simon Says Stamps Monday Challenge: Layer It Up and Simon Says Stamps Flickr Challenge #67: Think Spring. Extra Details: I started by stamping my images and sentiment on a panel of white cardstock. I masked the stem of the flower so it looked like the mouse was holding it. I added some color to the corner with Cracked Pistachio Distress Ink and a Mini Ink Blending Tool. I used colored pencils to add color to the mouse and flower. 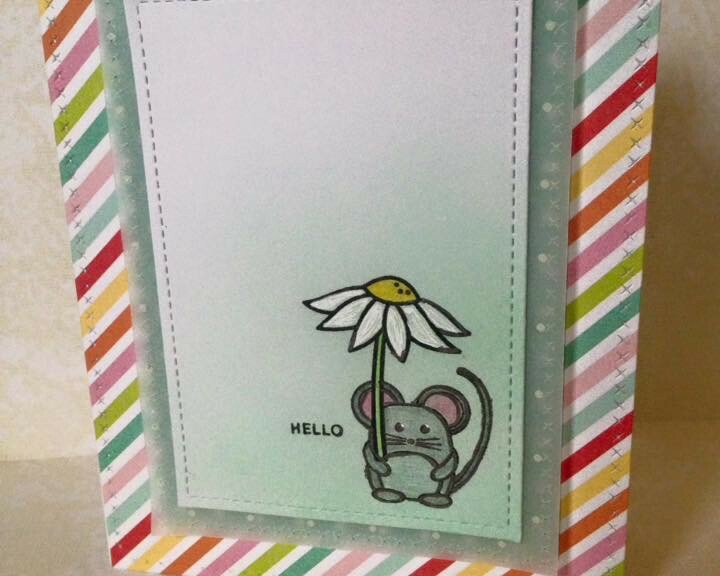 I used a white gel pen to color in the petals of the flower, and add some detail to the mouse’s eyes. Once the white gel pen was dry, I outlined everything in a black gel pen. I felt like it made the two stamps from different companies look more alike. Next, I die cut the stamped panel with a small stitched rectangle die. I also die cut a piece of dotted vellum, blue polka dotted patterned paper, and striped patterned paper with stitched rectangles. Then, I began layering all of the papers together. I added the velum to the back of the stamped piece. I added a layer of fun foam behind the velum. Then, I added the blue patterned paper. I played with the edges of the velum to add some more dimension. I adhered the striped paper to a white card base. Lastly, I adhered the stamped panel and additional papers to the card base and the card was done. This card was just fun to make! 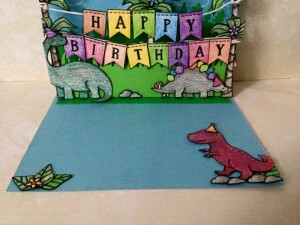 I had a left over pop up card base that I wanted to use and an idea for a super cool birthday card. I LOVE the way this one turned out. Extra Details: I started with the left over card base. It was made from light blue card stock. I stamped the clouds in white pigment ink. 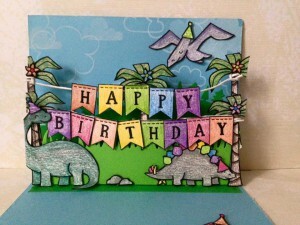 I added a dark green tree border that also had pop up tabs to the inside of the card base. Lastly, I adhered the grassy border piece to the pop up tabs and the card base was complete. 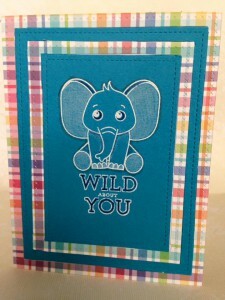 For this card, I stamped and colored a lot of images from Lawn Fawn’s Critters From the Past set. The banners are from Simon Says Stamp’s Cuddly Critter Accessories. I used colored pencils to color everything. I added some detail with a white gel pen. Once all the images were colored, I carefully cut them out on the stamped lines. After cutting, I used a black marker to paint the edges of all of the images (Yes, even the tiny flowers, party hats, and rocks). I used glue dots to adhere all of the larger images. I hung the banners on a piece of thin white twine I had in my stash. I wrapped the twine around the trees and a glue dot to hold them in place. I backed the banners with some copy paper to keep the glue dots from sticking to the card base. I used liquid glue to adhere the tiniest images. Welcome to our First Challenge!